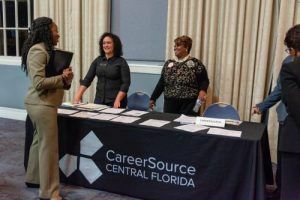 When Pam Nabors, President and CEO of CareerSource, came on board with the workforce agency in 2012, she quickly realized that Jobs Partnership and CareerSource were serving the same people in some of the same spaces. They were seeing individuals looking for their first job who needed life skills, so they would refer to JP’s LifeWorks training. JP had graduates who had overcome barriers and were now more prepared for employment, so they were connected to CareerSource. As CareerSource defined their niche customers – those struggling to get by and lacking skills and a support system – and Jobs Partnership was targeting men and women who needed life support and coaching to overcome some barriers, the natural evolution occurred. JP could provide CareerSource with a talent pipeline to help reach their goals of bringing people to prosperity and talent to the business community.